Sky Ball Golf Review – thumbs down! Let me set the scene before we dive into Sky Ball Golf — it’s the little man’s sixth birthday, and everyone is asking “what should I get him?” We recently went into his room before our trip to the beach and looked around for some toys to bring with us, and both he and I realized that he doesn’t play with any of his toys anymore. All of the hundreds of dollars we spent on Disney toys, and action heroes, nothing. The only things he plays with now include the word “ball.” Football, baseball, basketball, hockey ball (you get the point). With the Skyball Golf set, kids get a Skyball golf club and a see-through hypercharged Skyball golf ball that is filled with a combination of helium and compressed air, pretty cool. They recommend you place it on a real golf tee (good luck balancing it) and kids get the effect of a ball going far. Well, after the “kid test”, it failed. My son just turned 6 and took 4 swings saw the ball go a couple hundred feet and was bored. He can do the same thing with a regular golf ball he said, and “it’s feels cooler.” Well that wasn’t enough for dad, I had to try it out myself too. Sure enough, crap. Neither me or my son are very good golfers but the Sky Ball Golf was pretty weak and completely uninteresting. The interesting twist to this review, my son took the ball itself and actually had a lot of fun with it. The cheap golf club that came with the Sky Ball Golf set was kind of useless, but the ball itself bounces really high, and can be a lot of fun when coupled with real sports items, like a baseball bat, or a hockey stick. 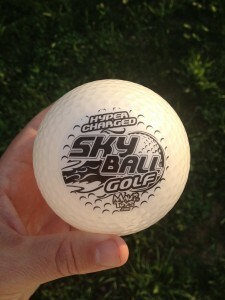 So my opinion of the Sky Ball Golf set is poor, but Sky Ball in general, big fan.